Many dance teachers, concerned parents and health professionals are struggling with what they see going on in the dance world, especially online. Every day we are seeing images of stretches that we know must be unsafe, however the students who to do them are also often performing at a high level and winning competitions. Dance teachers who avoid over stretching and err on the side of caution, avoiding things such as oversplits in second often feel like they are being left behind, and face pressure from students and parents alike to "move with the times". I have kept quiet about this particular issue for some time because I have always tried to focus on the positive rather than criticise anyone else's training, but some of the things I have seen recently online are getting ridiculous. I am also being asked more and more frequently for a post that teachers can direct the parents of their students to, to explain the reasons why this type of training must be done very carefully. So here goes!! So, is over stretching bad? The mere fact that so many people ask me this question seems to indicate that they know that it is... But why is it bad? And what can we do to still achieve amazing mobility without unnecessary risk of damage? Just to clarify - I have no issues with extreme mobility when achieved safely, and combined with the appropriate control. In fact, much of the work I do with the high level, truly elite children is focused exactly on this. Our 3 day teacher training course focuses on how to optimally train each type of body and work with specific restrictions to develop optimal mobility and control in all dancers. However we focus on achieving this through educated and intelligent, up to date, smart ways, to avoid any potential issues, and the students are educated to manage their own bodies. The level of performance in all styles of dance has accelerated massively in the last few years, and as such the training techniques to support this have changed dramatically. Unfortunately this means that we have limited knowledge as to the long term effects of these techniques and many people are quite rightly concerned at what is going on under the surface. While other disciplines such as Rhthmic Gymnastics and Contortion have been over stretching and training in extreme ranges for years, there is still little formal research on the long term effects of this kind of training on the individuals involved. While it is true that there are some bodies that survive training like this, there is a huge attrition rate along the way, and many people advocating extreme training have no idea of the long term trouble they may be causing. Every day in my role as a Physiotherapist I see people suffering from old injuries sustained by over stretching, repeated extensions and excessively mobile and unstable joints from early training. Unfortunately the slow and hard rehab that so many people have to go through to just be able to live a normal, pain free life is not so dramatically entertaining so doesn't get the coverage that dramatic photos and videos of performances involving extreme flexibility do. So what is "Over Stretching"? The general view is that over stretching is taking any joint past its natural physiological range, and especially stretching the ligaments that normally help support the joint, so that it becomes more mobile. Over stretching may also be where the individual is forced into position resulting in traumatic damage to the tissues that previously restricted range. Many young students, especially those who already have hypermobility, are being put in ranges that overload one particular area, in their desire to achieve dramatic ranges of flexibility. I feel so sad that so many people are thinking that this is a good idea, and great entertainment, when they have no idea what the true cost is. What are the risks of over stretching? She seems to enjoy it! If it doesn't hurt her, surely its ok? Are there dangers in over stretching in young students? How do you know if they are stretching too much? What are the risks in different positions? She wants to be a professional dancer; isn't this just a part of it? What is the long term effect on these students hips, back and knees as they move from being a passionate young dancer into either a professional dance career, a teacher, or a 'normal' person trying to live a healthy life? Is there another way of achieving the same level of mobility safely? Why can some people do it easily and others can't? 1. What are the risks of over stretching? If joint, such as the hip, is pushed past its normal range of motion there is a risk of damaging the surrounding tissues, including the labrum of the hip, the ligaments that surround the joint or in the case of the spine, the discs that give us the capacity for shock absorption and spinal mobility. In young students whose bones are not fully developed there is also a serious risk of damaging the shape of the hip socket, or developing spinal stress fractures or Spondylolisthesis. Long term, over-stretched joints carry a higher risk of developing arthritic changes due to the wear and tear on the cartilage. 2. She seems to enjoy it! If it doesn't hurt her, surely its ok? There is a cumulative effect of the damage sustained due to over stretching. As the ligaments that are designed to support each joint get more and more relaxed from excessive stretching, the internal shifting of the joint surfaces against each other increase. This is a huge contributor not only to pain in the muscles attempting to support the unstable joint, but long term wear and tear of the cartilage inside the joint, leading to early degeneration of the joints. 3. 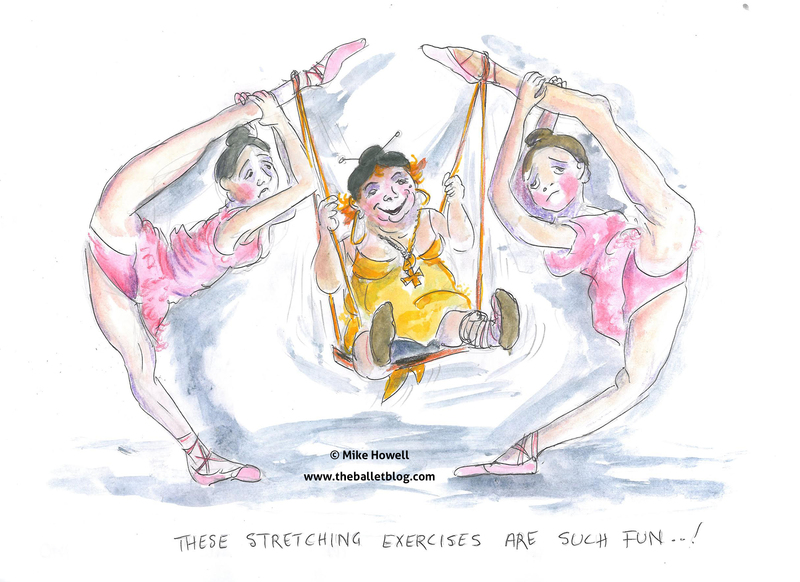 Are there dangers in starting extreme stretching in young students? Yes. I now have X Ray evidence of the damage that can be done to young hips through aggressive stretching. Adolescent bones (especially in the pelvis, spine and foot) are very vulnerable and any kind of extreme mobility training in young students must be very carefully considered. 4. How do you know if they are stretching too much? During any flexibility exercises, students should not be experiencing pain. If they are grimacing, crying, or trying to shift out of the position the body will be fighting back and chances are its not safe. We must also be very careful of the timing of our flexibility work. Even careful sustained stretches should not be done before class as if a muscle is held in a static stretch for longer than 30 seconds, then it will not work at its full capacity for at least half an hour afterward. Students will often feel "gamby" and less controlled, which puts them at risk of injury. 5. She/He wants to be a professional dancer; isn't this just a part of it? No. And again it depends on what kind of dancer they want to be. Being a professional dancer in most genres requires a good level of flexibility, however this must also be accompanied by a high level of strength and control of the hips and dynamic control of the spine to be able to have a long, sustainable and enjoyable career. For instance, if your goal is to be a classical ballerina, then being able to do a 'needle' or 'back scorpion' when you are 12 is not part of the skill set required, and will most likely be detrimental due to creating too much movement at one joint. However if you want to be an acrobatic circus performer then it will be more relevant. 6. What is the long term effect on these students hips, back and knees as they move from being a passionate young dancer into either a professional dance career, a teacher, or a 'normal' person trying to live a healthy life? Excessive mobility in any joint requires more fine, co-ordinated control of the stabilising muscles around it and will require a huge amount of dedication to 'rehab' style exercises to remain pain free. It is essential that dancers have good postural control and endurance, and spend time keeping each joint healthy to avoid the pain associated with excessive mobility and joint degeneration. Without this strength and articulation, individuals are often plagued with long term back and hip pain that can be very hard to treat due to the instability of the joints. 7. Is there another way of achieving the same level of mobility safely? Simply put, I consider stretching into the direction you want to go the slowest and most dangerous way of actually getting there. Pushing into a restriction often engages a reflex contraction of the tissues which will have to be pushed through, potentially causing soft tissue (or ligament/capsular) damage. Instead of over stretching and forcing young bodies into the direction that they are trying to achieve, I focus on using that 'stretch' as a test, analysing what is actually causing the restriction, then performing calculated, specific mobilisations, and releases of those individual structures. Then, when the movement is tried again, it is much easier. This can all be done without pain or the risk of damaging muscles or ligaments. Working correctly with the fascial system can also give enormous increases in mobility with no risk of damage. Our understanding of the nature of fascia has exploded exponentially in the last 20 years, and it no longer means aggressively using a Foam Roller or Deep Tissue Massage. Fascial mobilizations such as those shown for the upper back HERE and the hips HERE may feel very easy to do, but can have a profound effect on your mobility. For instance; a Google search on the word "Fascia" in 2001 gave approximately 1500 entries. Search for that word now and you will get "approx 48,000,000"....! It is essential that we upgrade our training techniques to "move with the times" and use this amazing new research in the best possible ways. Students must learn to work with their own body, and how to be sympathetic with its quirks rather than fighting it, resulting in greater, more usable flexibility, with far less risk of injury. I have turned my attention to training teachers and health professionals safer ways to work with their dancing students to make dance training safer world wide. 7. Is PNF Stretching OK? While many adults find PNF or Contract / Relax stretching an effective way to increases their mobility, I do not believe that this technique should be used in students under the age of 16. Many major muscles, including the hamstrings and quadriceps attach onto major growth plates. Aggressive stretching during periods of growth may result in Avulsion Fractures (where a fragment of bone is torn away from the main bone). These injuries are often hard to rehab and often require a long time off dancing to do so. 8. Why can some people do it easily and others can't? Physiologically, we are all different. Some people naturally have more mobility in their ligaments than others and will find it easy to go into some positions. Often the ones who find it easy need the most care, as their ligaments will be less resilient long term. I have seen many students posting photos of their excessive mobility online who I suspect have undiagnosed Ehlers-Dalos Syndrome. If a student has this condition, it is even more important to ensure that their training does not over stretch their already weak tissues. Individuals with more mobility in their joints will often also find it harder to sustain a good postural position, resulting in constantly sore lower back and neck muscles. Those with Joint Hypermobility Syndrome or Ehlers Danlos Syndrome may also have issues with their bladder and bowel as all of their connective tissue is affected. If you are involved in training young students it is very important to be aware of the possible dangers that exist, and to understand that training young adolescents is different than training adults. It is our responsibility to learn the safest possible ways for them to achieve their goals, as well as educating them on the appropriateness of their goals to their chosen career. This is why I am putting so much effort into developing comprehensive teacher training courses to give teachers and health professionals the skills to help students do amazing things safely. I am very worried about what is going on in some "master classes" and workshops where average kids are being forced into positions, with the promise that it will make them famous - when in reality it is more likely to injure them. Forceful over stretching in one session is not the way to get more mobile. Over stretching xcessive joint mobility is different to excellent flexibility and is not a requirement for success as a professional dancer. We need to be thinking of our students as human beings with so much potential, not just disposable performing ponies. I can say for sure that if I am ever blessed with a daughter I will certainly not be letting her put her body at such risk for the sake of someone else's entertainment. There will always be someone who is willing to do this - but I anticipate a very long life and I would rather she enjoy all of it! I also do not subscribe to the suggestion that performing at an elite level has to result in long term damage! My focus is on giving athletes long, sustainable careers, where their body is continually honed, refined, and specifically trained to achieve the ultimate level of performance. This in turn makes them an exceptionally high functioning human being beyond their performing career. This does take time and effort, but the results are well worth it. We just need to change our mindset as it does not have to be a one or the other scenario. It just needs more education, and more care. If you have any questions about specific stretches, or you would like to learn how to get more mobility safely, please feel free to CONTACT US at Perfect Form Physio for a session in the clinic with one of our amazing Physiotherapists or via SKYPE.We work closely with dancers all the time - so we know what your needs are, and can help you find safer ways to improve your mobility. Learn more about our Level One Teacher Training workshop HERE. I hope this all makes sense, and answers all of the questions that have been put forward. I will continue adding articles on this topic, so keen to hear your feedback, and anything I may have missed!